Some platforms are obviously dearly loved. 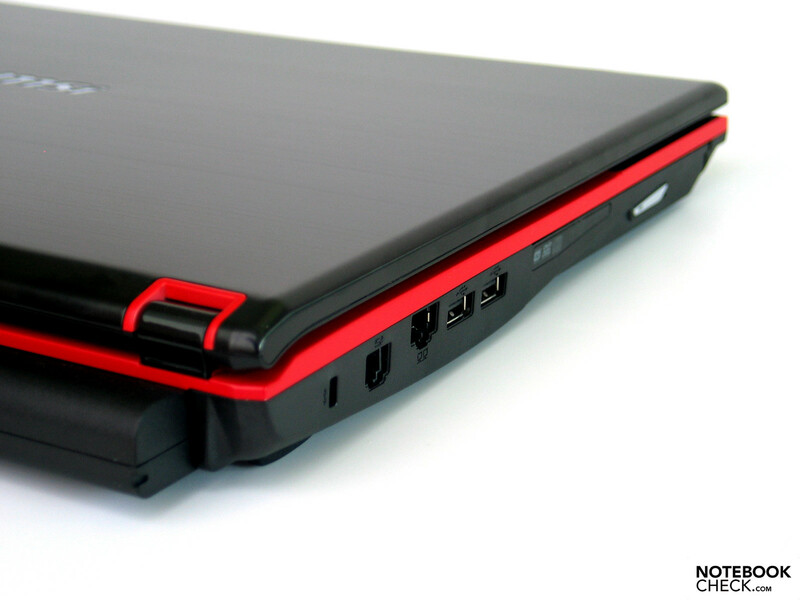 This is also the case for the well-known, colorful 17" Gaming Barebone from MSI. With an Intel Core i7-720QM and ATI HD5870 graphics, it celebrates its return in the GX740 and promises first class gaming performance. Those familiar with the MSI can't be fooled. In front of us is a well-known barebone which has tried to win us over under an array of designations. 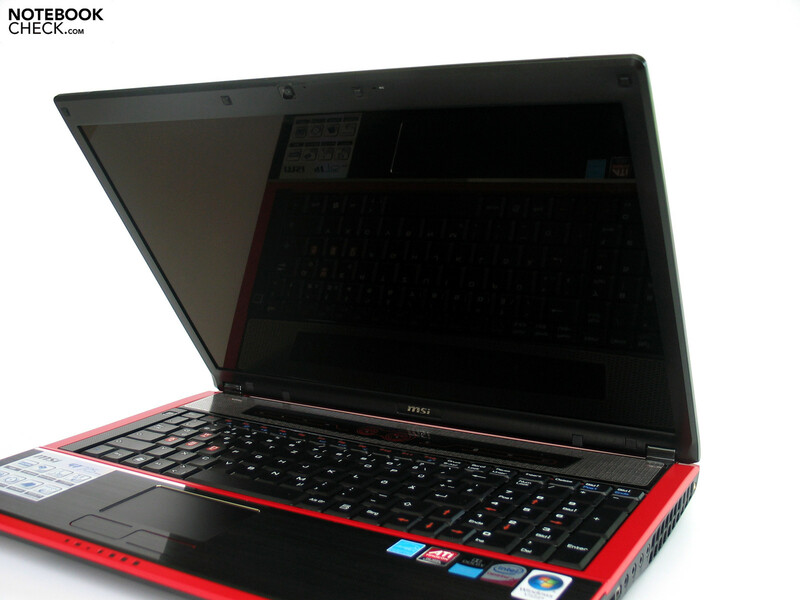 Notable examples here are for instance the Medion Akoya X7811, the MSI GT725 and the GT740. In the case of the Medion Akoya we are also dealing with a nearly identically equipped model which also comes with an Intel Core i7-720QM and the currently strongest (ASK?) 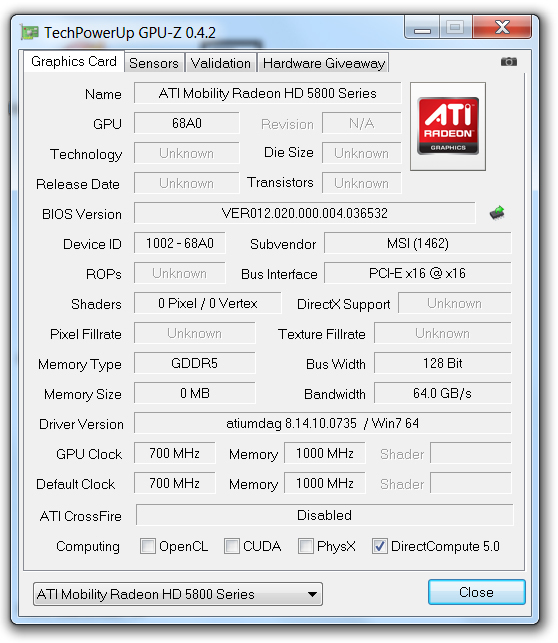 SLI/Crossfire graphic card, the ATI Mobility Radeon HD5870. 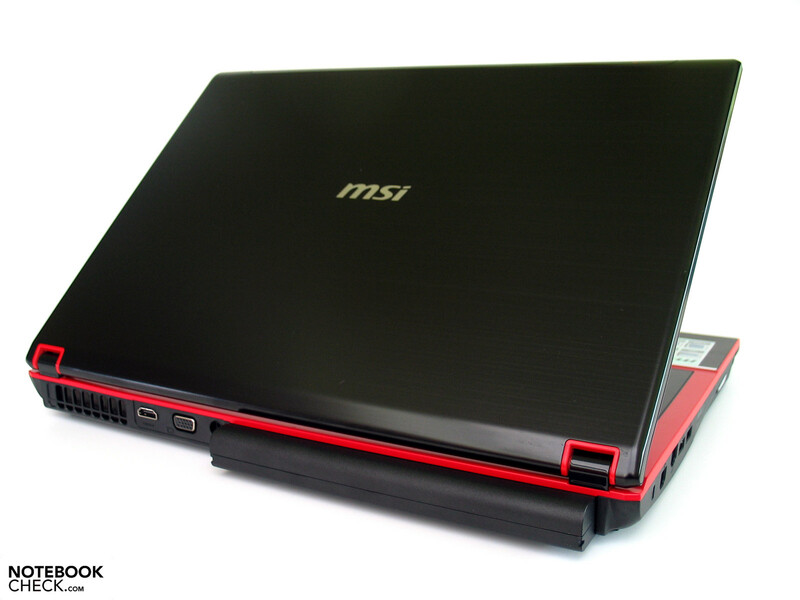 The pictures found below in this review come from our review of the structurally and optically identical MSI GT725. In terms of the case, one can basically refer to our review of the identically constructed models mentioned above. 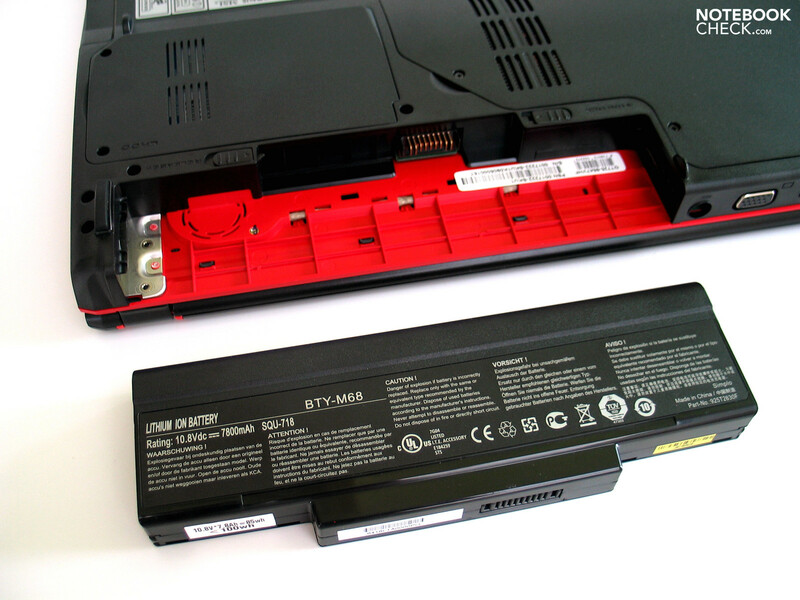 Here a quick summation of the pros and cons of the barebones in service: MSI equipped our test example of the GX740 (equipment variant i7247LW7P) with a 9 cell battery. Compared to the Medion Akoya, the weight of the machine rises to 3.37 kg. The somewhat compact dimensions of 395X380X42 mm remain the same with the exception of course of the slightly protruding battery out back. 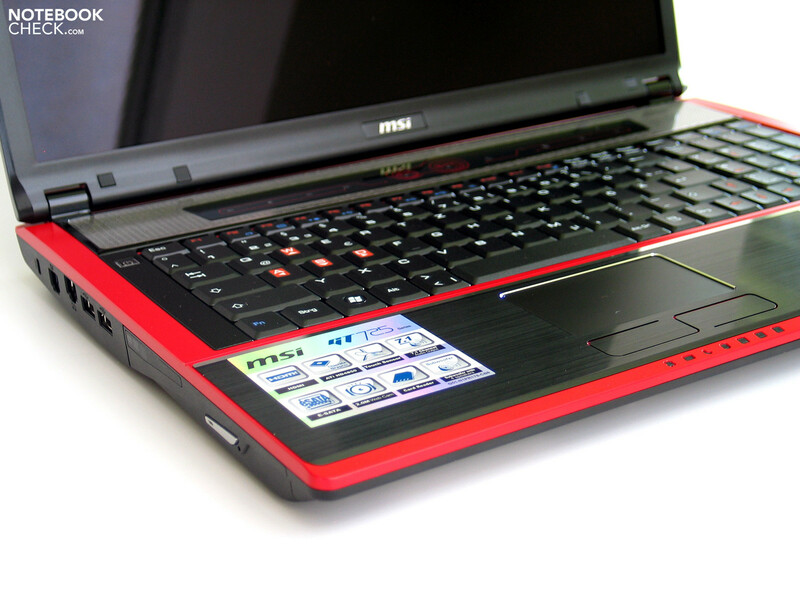 In terms of color, MSI stays true to the red-black-silver mix. If that combination works is of course largely dependent on the user's individual preferences. 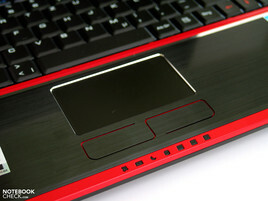 Medion had a go with a brushed silver aluminum surface for instance. 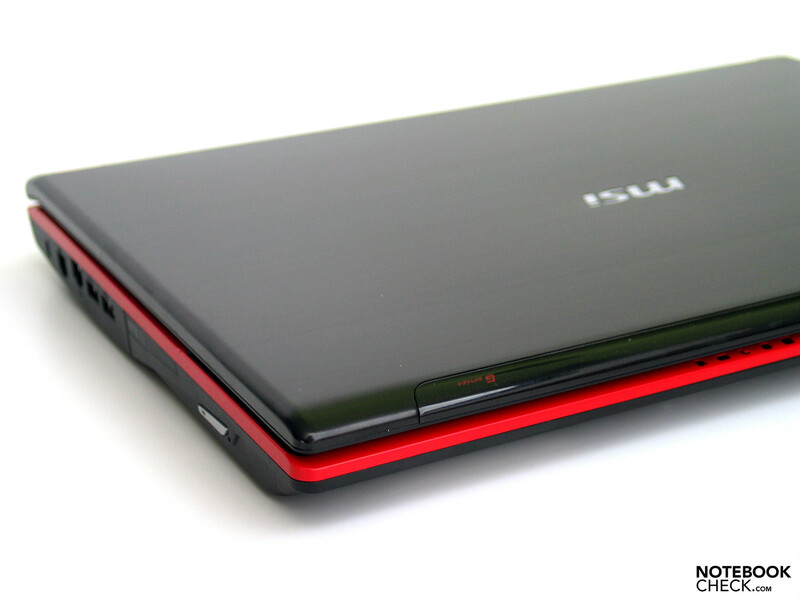 Speaking of aluminum: the MSI GX 740 of course also gets the familiar aluminum applications which enhance the look and feel as well as the overall impression of quality somewhat. Depending on the demand, the stability of the case leaves room for criticism. One could mention the relatively small hinges which allow for significant teetering of the display or the weakpoints around the area of the display's lid and the base unit above and below the optical drive, where isolated pressure impressions could be made. We were pleased however with the magnetic fastening mechanism which holds the screen securely closed. 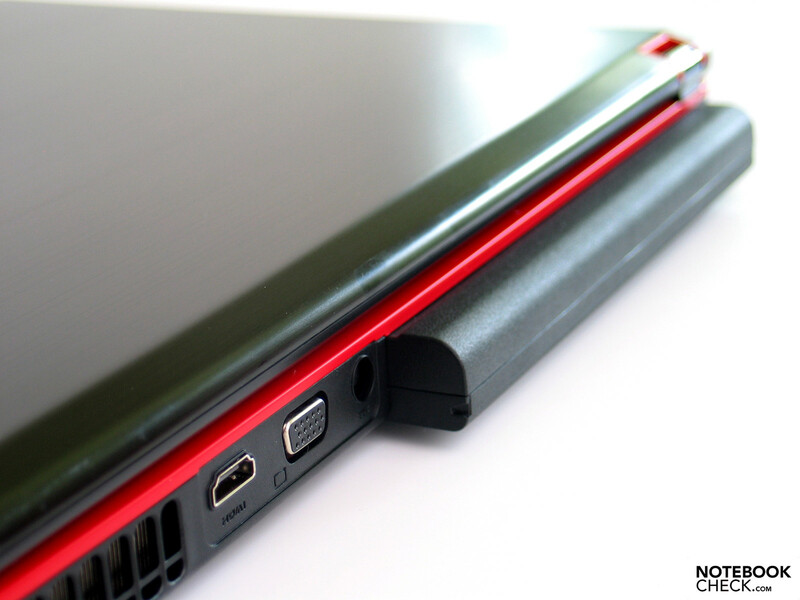 When it comes to the range of interfaces offered, the MSI GX740 doesn't need to shy away from comparisons to other gaming notebooks. Along with HDMI, one also finds Firewire and eSATA on the machine. The placement of the individual ports is worthy of discussion, however. While VGA, HDMI and the power supply were still placed in the rear and thereby pose no interference problems with connecting an external monitor, the LAN port (where on our tester the respective connector could only be held in place in a wobbly fashion) is placed on the left edge, though luckily more in to the rear. While lefties are favoured when the interfaces are occupied, one still finds a full array of audio ports, a USB interface and eSATA. In terms of its communication technology, the MSI GX740 in question offers a solid base configuration thanks to a Gigabite Ethernet Controller from Realtek and an Intel WiFi Link 5100 AGN module. Furthermore, the notebook has integrated Bluetooth technology and an integrated, though somewhat dated modem. Among the accessories, the included MSI gaming mouse is worthy of mention and praise. The optical 6 button mouse is claimed to have an acuteness of up to 3200 DPI which are adjustable in three settings. More extensive tests were not carried out on the mouse. No doubt, the keyboard of the barebones in all of the tested variations was already a point of contention among us. However, as is so often the case, the personal preferences of the user and above all the quality demands are what matter. 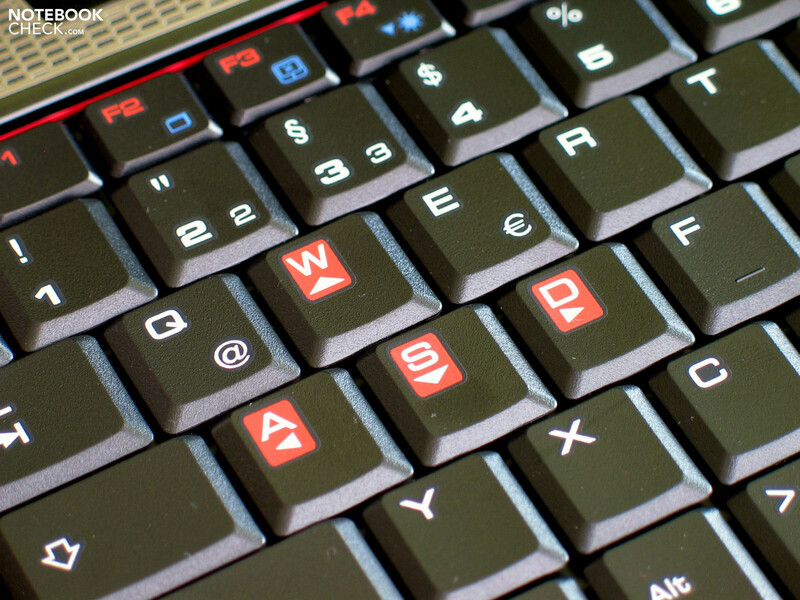 The fact remains that there are some peculiarities on the keyboard employed, such as the FN key on the far left like it still is on Thinkpads. This is a poor choice on a gaming device. 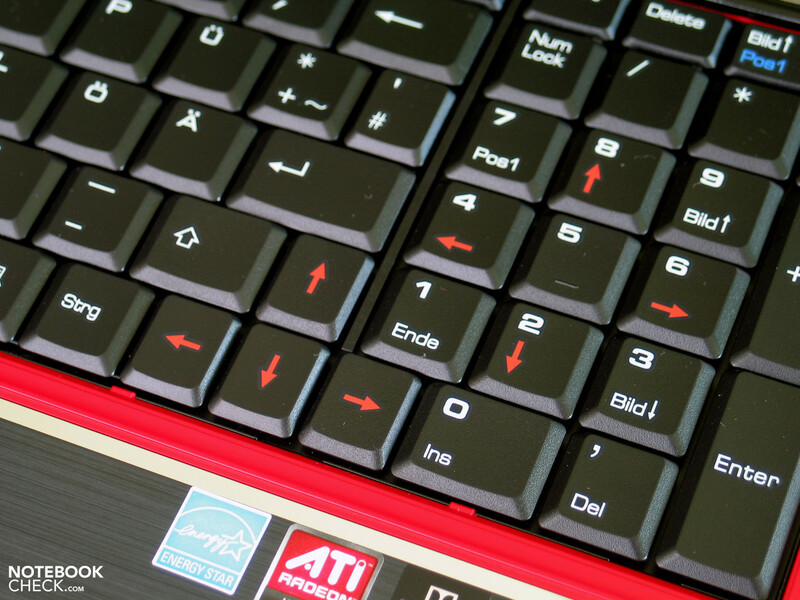 It gets quite cramped around the Enter key which is only single-spaced (German layout!) and layout out in a particularly narrow way. Both the [<>] and the [#'] keys were pushed out of their usual positions. On the whole, one needs a certain amount of time to get acclimated to the keyboard. The typing feel can be described as soft and almost spongy. This also goes back to the noticeable flex of the entire keyboard area under pressure. While the numeric keypad standing separately on the right edge is in our opinion well intended considered the constraints of the main keypad, one may have been better off by leaving out the numeric keypad altogether. In contrast to the keyboard, the touchpad showcases itself well. It is a shame that it plays such a minor role on this hardly mobile DTR notebook. 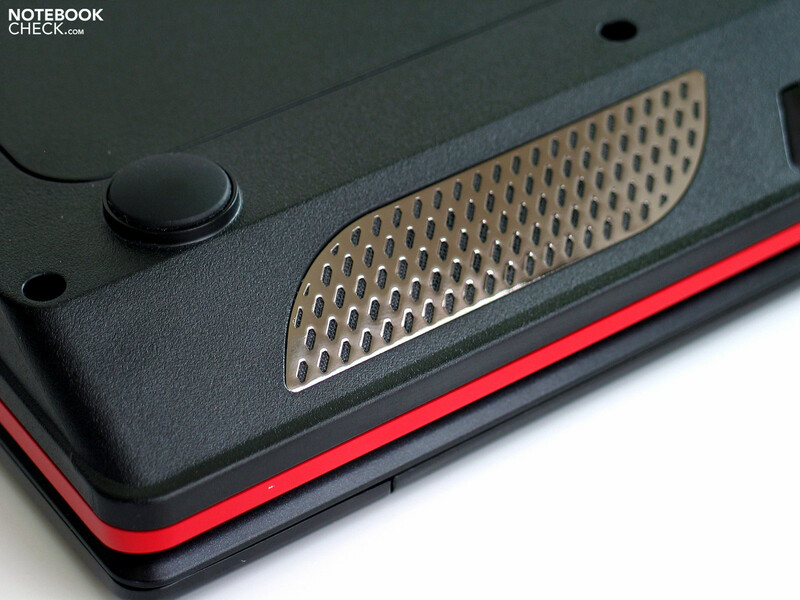 The surface of the pad has a smooth glide and allows for easy and precise control of the cursor. 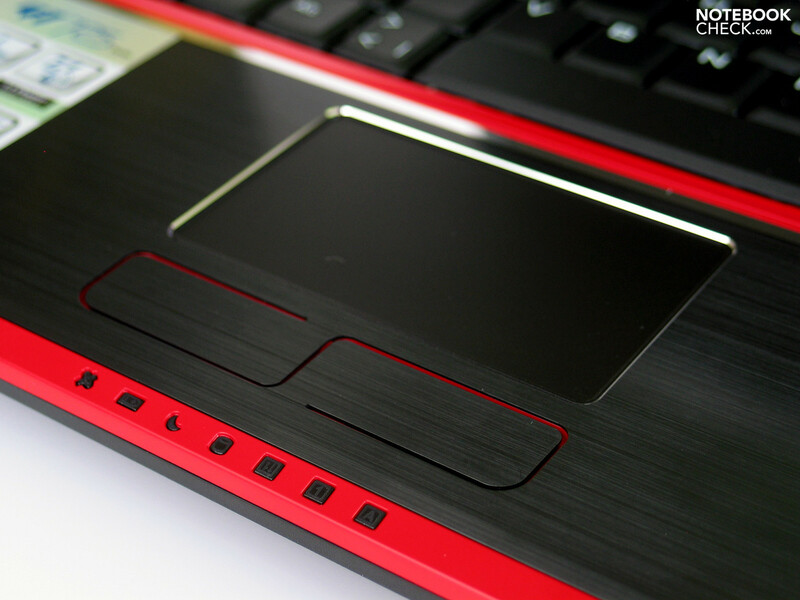 The two touchpad keys also impress. They are pressed with a well-dosed application of pressure and give a pleasant sensory and acoustic feedback. Apart from some minimal component and measurement related differences, we find the same display again in the MSI GX740 (Samsung SEC4A47) as on for instance the Medion Akoya 7811. We therefore refer you to the rubric in the respective chapter of our in-depth review. 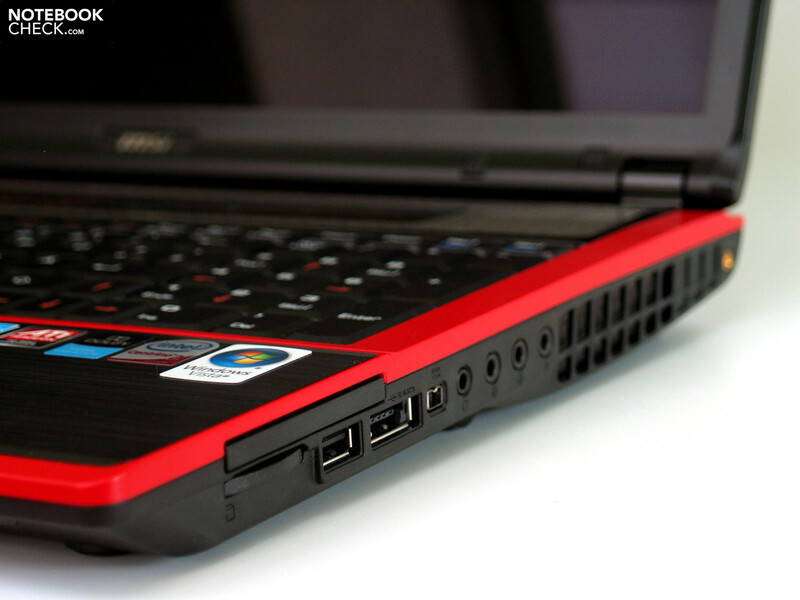 Considering the customer base of the MSI GX740, it would be redundant here to refer to the features of Intel Core i7-720QM Quad-Core CPU and the ATI Mobility Radeon HD5870. What matters or what is interesting to them is how the practical gaming performance, ideally with some benchmarks, stacks up against other gaming devices. For the sake of completeness, a few things should be said about the equipment: The 720QM is the smallest CPU on the current Intel "Clarksfield" palette and clocks with 1.6 GHz. 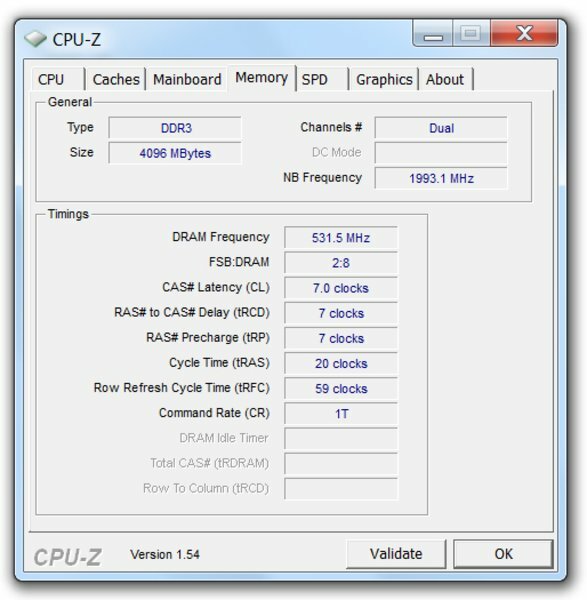 Thanks to the Turbo Mode, the CPU can however overclock individual cores up to 2.8 GHz. That happens dynamically depending on the demanded performance and the available cooling. Gamers therefore get optimal performance either through a high clock rate and/or the Multi-Core architecture. 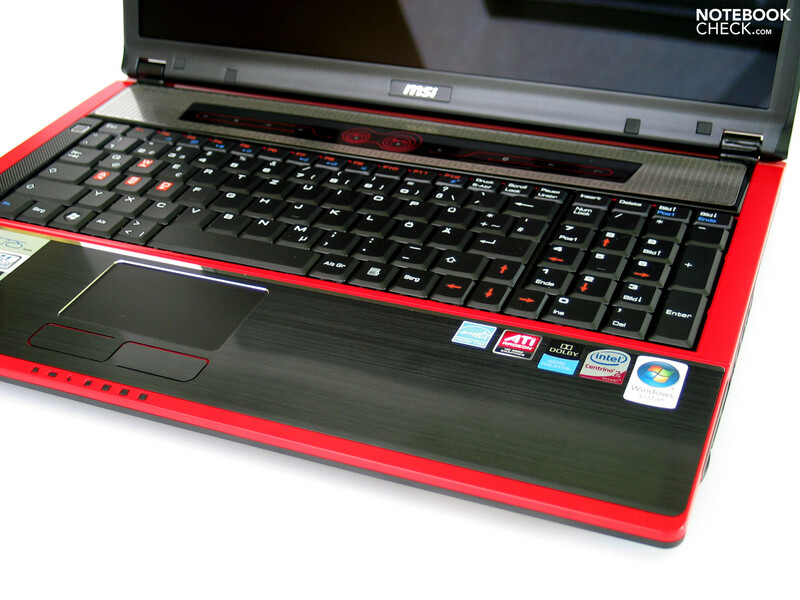 The HD5870 GPU is currently the fastest single graphics card solution available for notebooks. 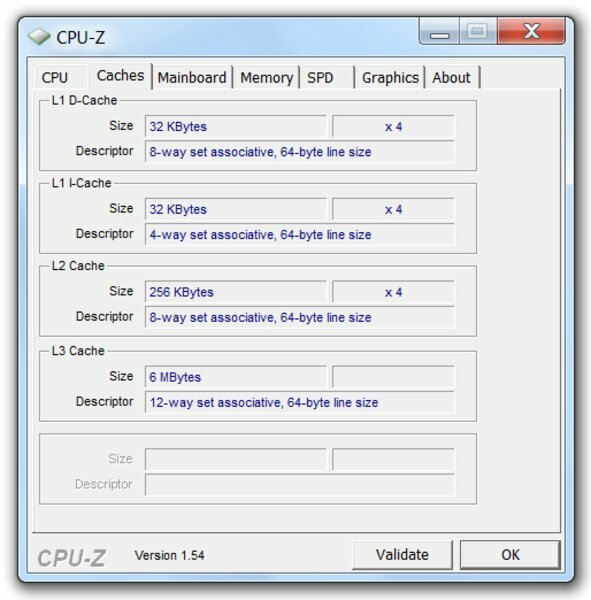 It supports DirectX11 and has various features which for instance support the CPU in decoding HD video material. For more details visit either our pages on GPU or CPU or go to the comparable review of the Medion Akoya X7811. Let's begin with a short analysis of the 3D Mark benchmark results. 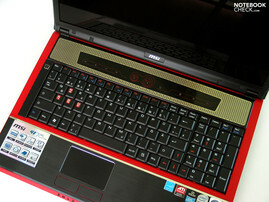 In the 3DM 2006, the MSI GX740 achieved good, though not outstanding results with 12403 points. Similarly equipped gaming machines like the Asus G73 (520M/HD5870), the Medion Akoya X7811 (720QM/HD5870) or the XMG7.c (920XM/GTX280M) were just above or below the mark of the MSI GX740. 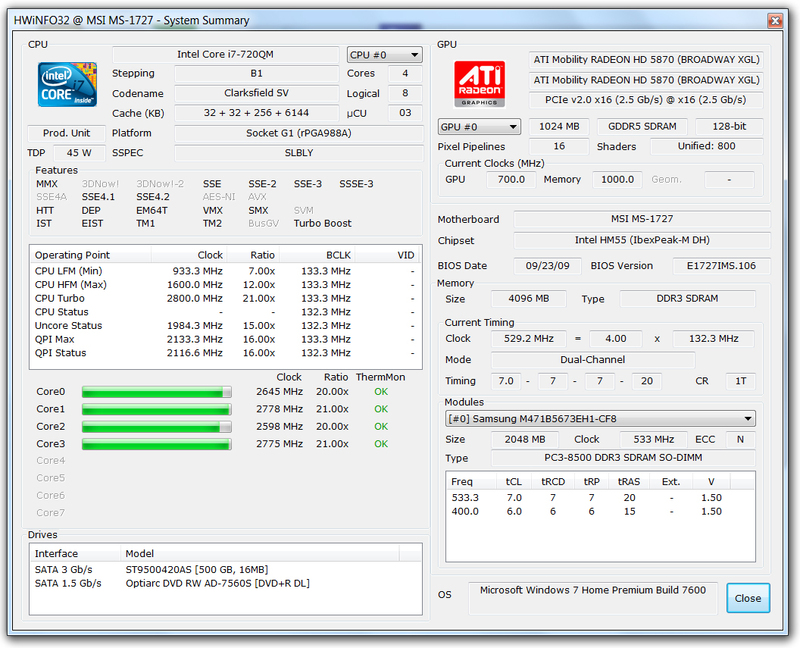 The best results with the ATI HD5870 so far came from the Devil 9700 DTX (820QM/HD5870) with 13451 points. 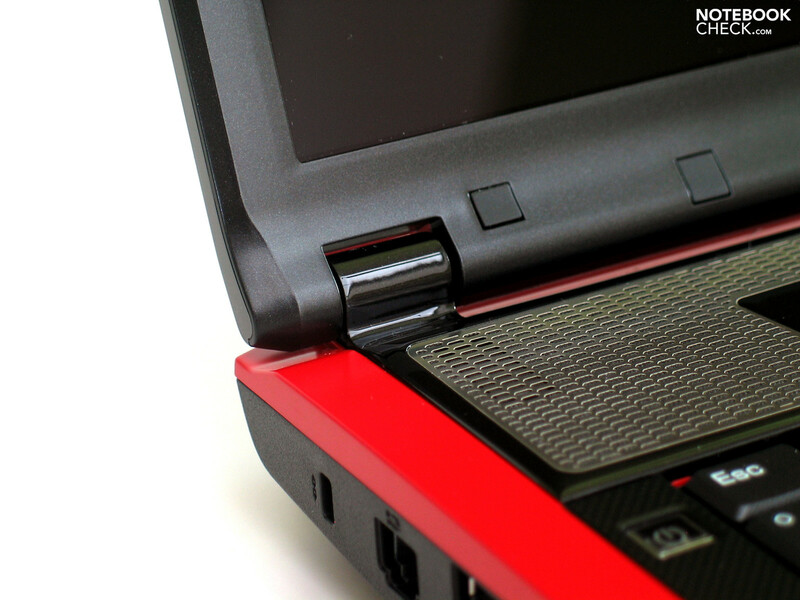 Only SLI or Crossfire solutions place clearly above this level, such as on the Alienware M17x (QX9300/HD4870X2). The 3DMark Vantage benchmark test told a very similar story. 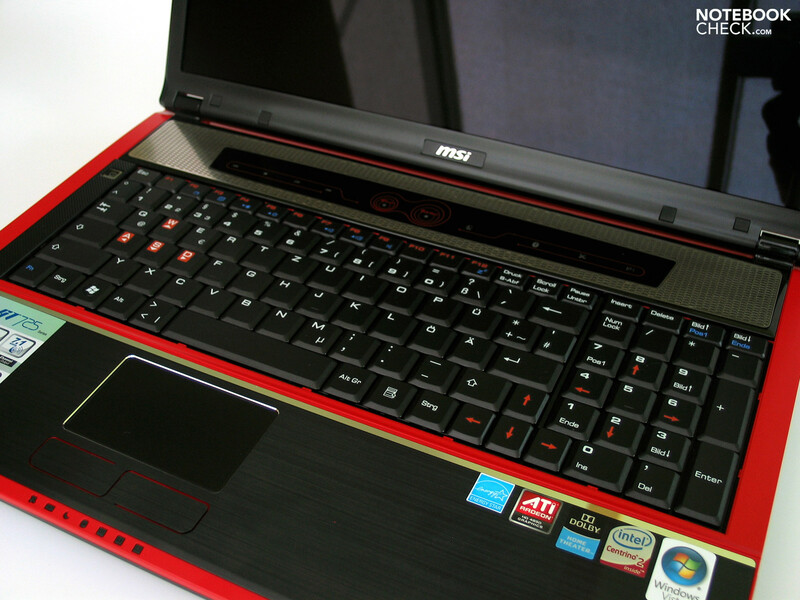 In this test the MSI GX740 achieved 7998 points and placed equally below similarly equipped gaming notebooks. Even if this is a minor point, still a few words should be said to the application performance of the GX740. The basis of our evaluation is the PCMark Vantage benchmark test. The accumulated rating of 6225 points heaves the laptop once again in the upper region of our databank. This other notebooks in this area are a different breed and we suddenly find office notebooks such as the Fujitsu Lifebook S760 or the Toshiba Tecra S11, both with significantly weaker graphic components. It is also worth mentioning that many of the gaming stars named before fall far behind in this measure. It is interesting that result of the Windows 7 performance index was significantly less than expected with a total rating of only 5.9. According to Windows, the reason for this is the memory. All of the other components (RAM, CPU, GPU) come out performing much better. This brings us to our final point before we turn our attention to various games, the hard disk. In the GX740 there is the familiar ST9500420AS unit from Seagate with a gross capacity of 500 gigabits and a rotational speed of 7200 r/min. 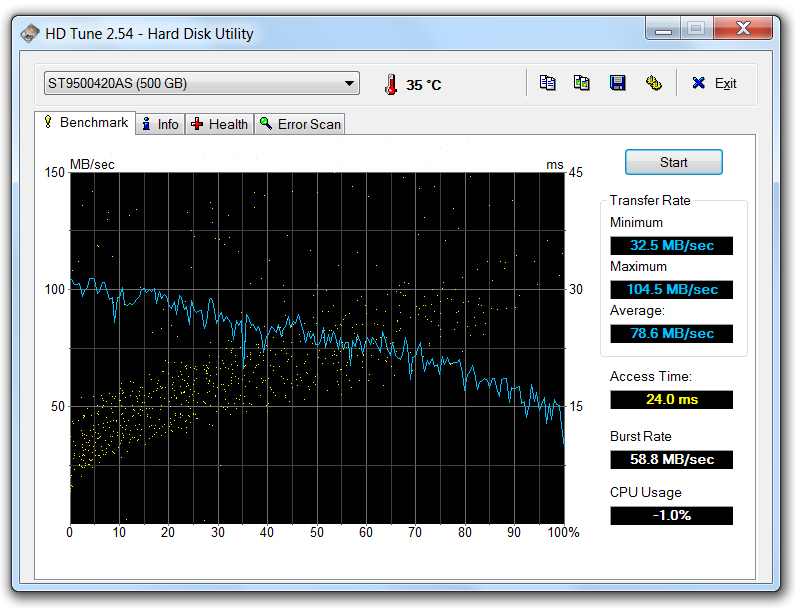 According to HDTune it has a transfer rate of 78.6 MB/sec. The access time of 24 milliseconds obviously accounts for some problems as it stand clearly below normal values. 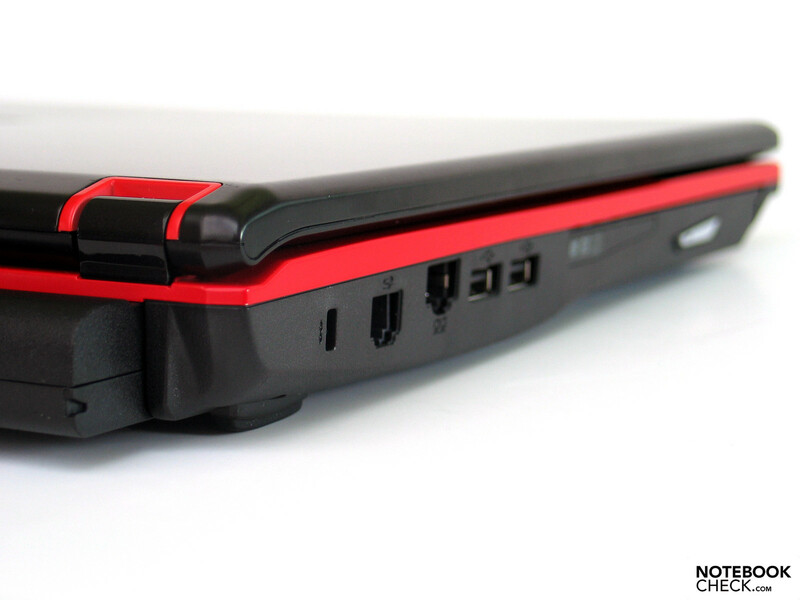 We now come to the headlining discipline of the MSI GX740. 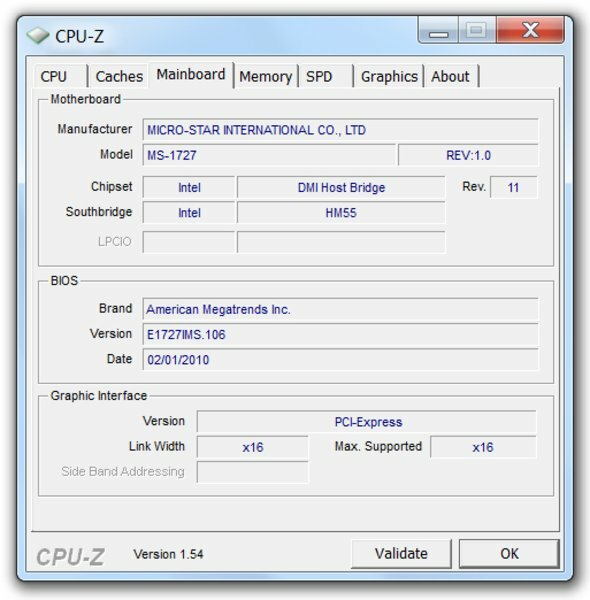 When it comes to performance in individual games, one can of course generally use similarly equipped notebooks as points of reference, such as for instance the structurally identical Medion Akoya X7811 mentioned numerous times before. Nevertheless, we conducted a series of tests with current games from differnt genres. Being equipped with the currently strongest graphic card, there is principally only one graphic setting which is exciting, that being the absolute highest. In the case of BF:BC2 we agreed on Full HD resolution (1920X1080), very high settings, HBAO on and 4xAA or 8xAF. The intro of the single player mode acted as a benchmark as previous tests showed it to represent the same level of demands experiencesd later in the game. The frame rate shows a curve mainly just above or just below the 30-FPS mark. But we also noticed some isolated, but strong breaks (click "...in comparison"!) which were perceived subjectively as jerks. On average, the GX740 achieved 30.9 Fps and is therefore around 2 FPS behind the Devil 9700 DTX in the best performance of the HD5870. Interesting: the HD5850 in the smaller GX640 (i5-430M) achieved here a practically identical result of 30.8. This means that for practical operations, one should cut back on the graphics in order to consistently stay above the 30 FPS mark. Its competitiveness suffers particularly in multi-player mode. Still, BF:BC2 can be played fluidly with first-class graphic quality which is helped by the fact that the integrated display with a resolution of 1680X1050 is already more than enough. Next to BF:BC2, MW2 is currently one of the most popular shooters, even though BF is a nose ahead in terms of multiplayer. It is a shame really as Modern Warefare 2 is significantly more sparing with hardware resources. We therefore also set this game straight to the highest graphic settings which were as follows: 1920X1080 pixels, max. details, all on, 4xAA. We carried out our in-game bench test with the first pass of the single-player mission starting with the fight at the beachhead up until the destruction of the Hummvee. The average refresh rate of 51 Fps was encouraging. A closer look at the protocol frame rate (click "...in comparison"!) reveals a consistent curve over the 20 Fps or the 30-40 Fps, though the spikes below 30 Fps remain well inbounds. Even in the game itself one can be pleased by a consistent, fluid picture cycle. The GX740 stands up strong in comparisons. The Devil 9700DTX with a somewhat stronger CPU can be surpassed slightly (50.7 Fps). 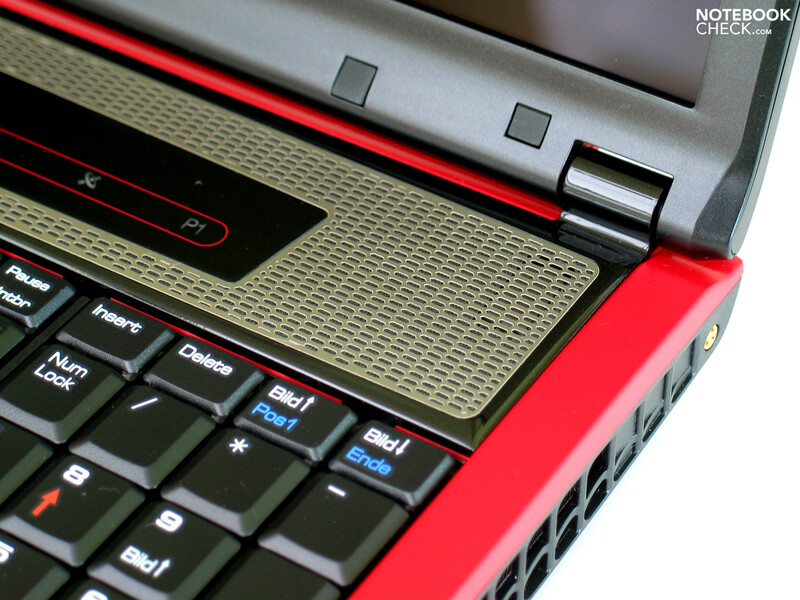 The GX640 gets 46.7 Fps, or 10% less, in this discipline. That means that one has little to fear with Call of Duty - Modern Warfare 2 on the MSI GX740. Even on its highest detail level the game runs butter-smooth across the display in its native resolution. From a different corner comes the game CMR: Dirt 2. Right, sounds like a racing game, and it is a racing game. The exception of Dirt 2 is mainly that it is a game that already supports DirectX11 effect. Still, with the HD5870 we have the highest performing GPU from ATI on board which once again was laden with the highest graphic detail settings. For the GX740 that means Full HD resolution (1920X1080), very high presets and 4xAA. Even though there are "only" 33.8 Fps to get on average, a look at the Fps progression shows a very consistent performance over the 30 Fps mark. Also subjectively, the integrated benchmark test ran nice and fluid. The MSI GT740 can once again surpass the Devil 9700 DTX in this discipline. With 30.9 Fps it is almost 10% behind and is even surpassed by the GX640 with 31.8 Fps. Also our final test for the moment with the MSI GX740 can set the mood for a serious gaming session and that is on the best graphic setting. Overall, it is almost a shame that the GX740 only has a WSXGA display with a max. resolution of 1680X1050 pixels. As we see according to the test on an external monitor (for reasons of comparison), the potent hardware in the notebook would also be fully able to light up a Full HD display. 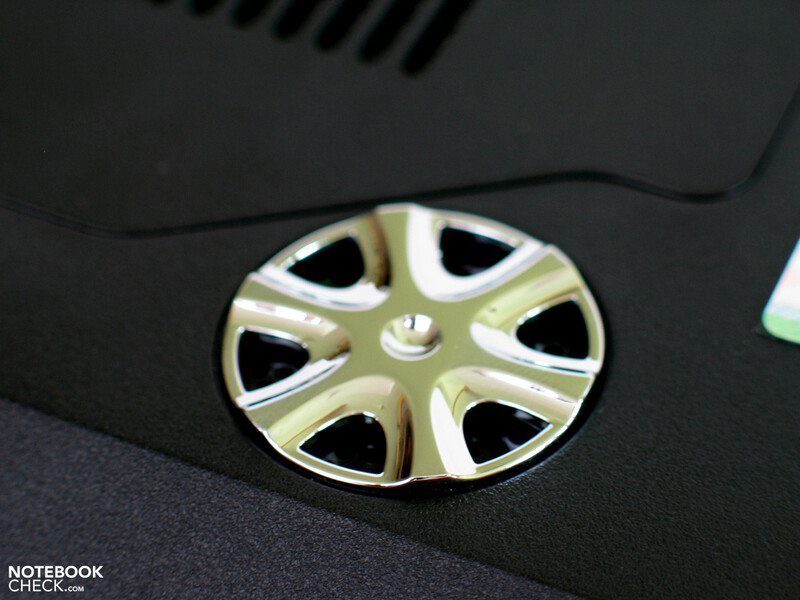 Only a few gaming notebooks achieve a balance between performance and reasonable emissions. 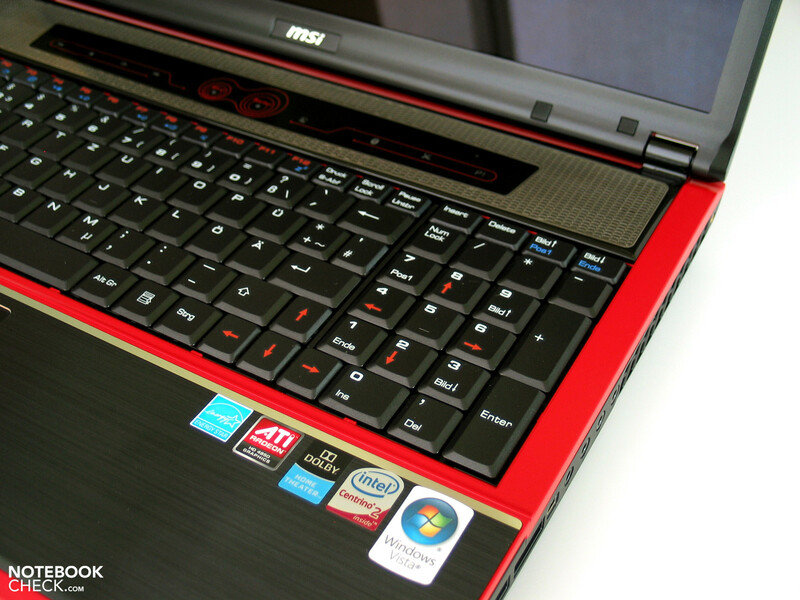 The MSI GX740 could not really be counted among these, at least when it comes to the notebooks noise level. One has to deal with a constant and clearly audible operating fan even during operations not under load. With 36.6 dB(A) on our measurement scale, this can be considered too present to those with noise-sensitivity. At times, short rev-ups during office applications to 41.9 dB(A) can be witnessed, which more or less always return depending on the level of load. The notebook really goes to work when in gaming mode. With 47.1 dB(A), the MSI GX740 makes no difference between playing a modern shooter on high graphic setting or even carrying out a stresstest (Primse95/Furmark). Subjectively, the notebook seems to stay within acceptable limits. One can more easily tolerate the bellowing fan during thrilling games, but the machine is overall unpleasantly loud. The heating of the case is not surprisingly similar to the Medion Akoya we tested. 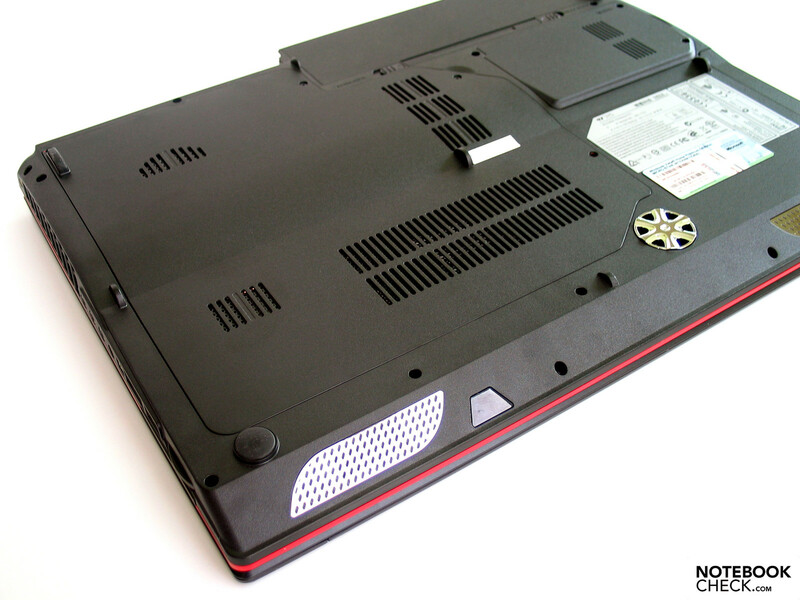 While the case has a comfortable temperature when not under load, the stresstest revealed that maximum temperature on the underside of the notebook around the fan rises to 46.5 °C. For a laptop which is used primarily stationary, this shouldn't pose a problem. It got a bit hotter in the internals of the MSI GX740. During our stresstest (Furmark+Prime95) to simulate maximum load on the system, we saw a max. temperature of 102°C on the graphic card of HD5870. 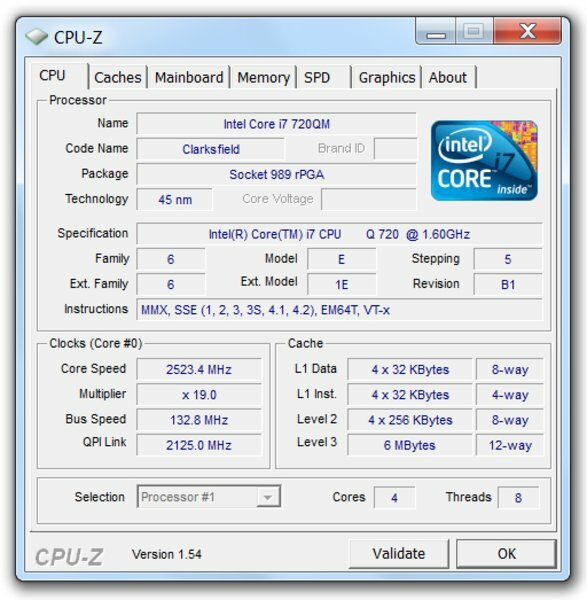 The Core i7-720QM warmed up to a maximum of 86°C. Both of these measurements are not surprisingly on the higher end, though if the cooling system has the loaded components continually under control, the temperature during longer tests levels out between around 85°C (CPU) and 93°C (GPU). There are not notable differences to be seem in comparison to the similarly constructed Akoya X7811. 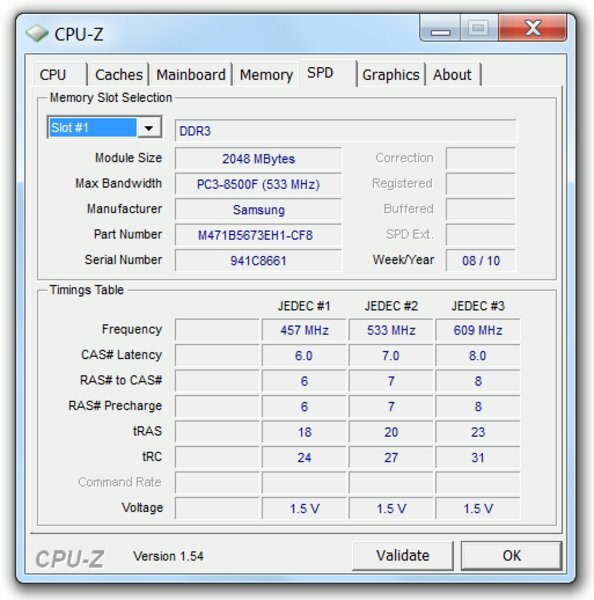 A benchmark test (3DMark 2006) run in direct connection to the several-hour stresstest resulted in an almost identical point rating as in cold operations (12364 to 12403). (+) The maximum temperature on the upper side is 37.3 °C / 99 F, compared to the average of 39.3 °C / 103 F, ranging from 21.6 to 68.8 °C for the class Gaming. 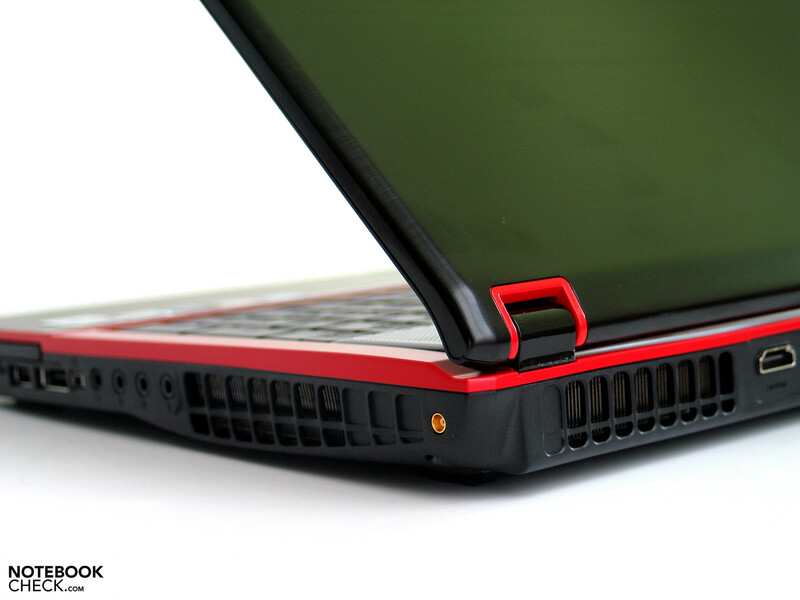 In terms of sound emissions, we can again refer to the structurally identical Medion laptop. The sound of the speaker/subwoofer combination can be described as fully competent and is also well suited for playing music. A slight bit of unclarity can however be heard at maximum output. The projected ambiance of computer games is also quite good. 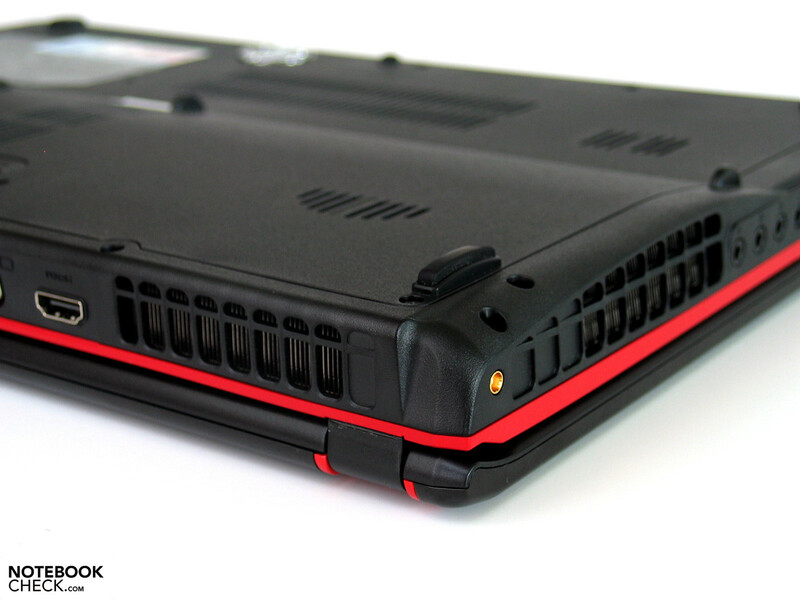 One thing differing the GX740 from the Medion Akoya X7811 is its larger 9 call battery. With a capacity of 85Wh, this offers around 50% longer life. Accordingly, we got these results from battery life test with the Tool BatteryEater (Readers Test): At 112 minutes in the test with maximum possible battery life, the MSI GX740 surpasses the Akoya from Medion by a similar margin (76 to 112 minutes). One can expect around 1.5 hours of WLAN surfing before having to reach for the nearest outlet. The current consumption of the gaming notebook before us was almost identical. The GX740 allowed up to 66W without load, and still 48.5W in the most favourable of conditions. It really goes to work under load as around 130W are sucked from the outlet in gaming mode. We could not register the peak of over 160W (Medion) on the MSI GX740. The power adaptor warmed up to 48.6°C rather moderately. This is interesting as the adaptor is performing at the limits of its capabilities at 120W. The GX740 is currently offered in numerous shops with a price starting at 1499 Euro. The structurally identical Medion with nearly the same features can already be had at an even more reasonable price. Considering the performance reserves, this seems like an attractive offer and practically all the latest games can be played at the highest graphic detail settings in its current configuration. 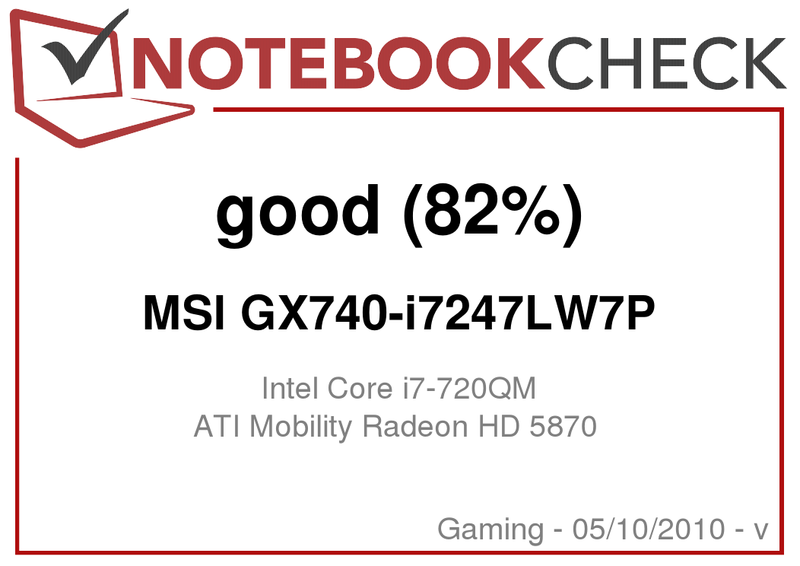 This should be the most weighty argument for the MSI GX740 as despite its first rate performance, one must also deal with a few weaknesses of this notebook. To again name a few, there is the keyboard which needs a great bit of time getting used to as well as the poorly illuminated display. Additionally, one has to live with the ever present background noise when playing and working on the GX740. The target buyers of the GX740 are first and foremost gamers with limited funds. 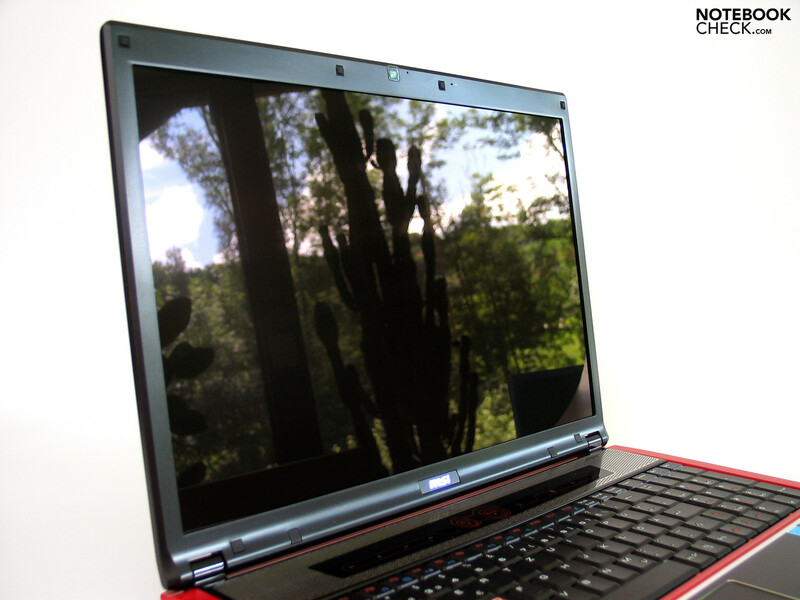 The GX740 offers close to the maximum possible gaming performance at an affordable price. The performance is impressive, no question. Once again: The keyboard. How does one just....?